Italy’s agromafia, detecting minced meat adulteration, seafood fraud in LA, and German beer substitution. Organised crime organisations have infiltrated the entire food supply chain in Italy – from field to fork – in order to siphon off subsidies, launder money and engage in food fraud, says the Financial Times in a special report. The so-called ‘agromafia’ has seen revenues from the activity surge from €12.5bn in 2011 to around €22bn this year, according to the newspaper, and now accounts for around 15 per cent of total estimated mafia turnover. It is thought that all the big syndicates, including the Neapolitan Camorra, the Sicilian Cosa Nostra and the ’Ndrangheta from the region of Calabria, are involved in the illicit activity. Researchers in Northern Ireland and the Czech Republic have demonstrated that a technique called rapid evaporative mass spectrometry (REIMS) can detect adulteration of minced meat down to a level of 2.5 per cent, in some cases within a few minutes. The technique could be “employed as a front-line testing method to ensure the quality and authenticity of meat products,” write the scientists in the journal Food Control. 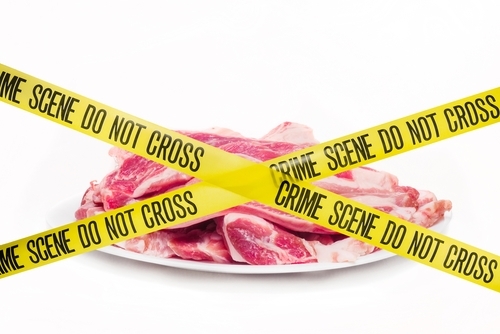 Substitution by a cheaper meat, mislabelling or addition of undeclared constituents are among the most common fraudulent practices in the food industry but can be extremely hard to detect. A monitoring programme to try to study seafood mislabelling, and specifically sushi fraud, has found that in most cases the substitution is unintentional, according to a report in the journal Frontiers in Ecology and the Environment. A team from the University of California Los Angeles (UCLA) have been taking samples of sushi sold in 10 restaurants and testing their DNA profiles, finding that while mislabelling was very common, restaurants are often unaware and – in some cases – the problem stems from ambiguous federal regulations that sometimes bundles multiple species under a single acceptable term, such as ‘Amberjack’. Unusually, the restaurants are willing participants in the trial with the aim of fostering partnerships on labelling and sustainability issues. Two men have been given suspended sentences in Cologne District Court for trademark infringement in connection with a scam that involved filling empty barrels of Kölsch beer – a premium, speciality brew of the region – with a cheaper substitute, defrauding their bar, hotel and restaurant customers, according to local news reports. The retailers obtained barrels of genuine Kölsch from top breweries such as Stamm, Gaffel, Dom, Reissdorf, Gilden and Früh between 2010 and 2015, substituted the contents and sold them for three time the purchase price of the beer – whilst still undercutting the genuine products. It is estimated they made upwards of €50,000 in profits from the ruse. They have been sentenced to 14 and 12 months in prison, in both cases suspended.